Some of the worst seats people have complained to me about are airline seats. The sitting mechanics they use are terrible for your body and cause a lot of discomfort. 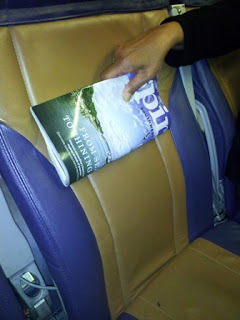 Unfortunately there are too many things wrong with airplane seats to fix everything but, there are a few tips I can give you that should find you feeling much better when you reach your destination. The first thing to do is to get your hips up so, you need to sit on something. Try a seat cushion first but if it’s too high in back then try a blanket or whatever you have with you. Next, you need to support your lower or mid back. Take a look at the airplane seat in this picture. Notice in the mid back area how the seat is banana shaped? Sometimes the arched part is down into the lower back area. Where ever it is you need to support your back there it will end being as hunched over as the seat is. Take a thin magazine from in front of you and fold it in half. Next place it behind your back and move it up and down a bit until you feel it give you the best support. I have flown across the country this way and felt refreshed and awake, without the usual aches, when I arrived. What a pleasant surprise!